This 6-foot-tall (2 meter) gazebo was built with D-shape 3-D printing technology. The monolithic sandstone structure was made of about 200 thin layers and is shown unfinished (left) and after a week of finishing by hand. It was designed to look like a micro-organism called Radiolaria. The structure in the background, overhead, is the printing device. Future astronauts might end up living in a moon base createdlargely from lunar dust and regolith, if a giant 3-D printing device can workon the lunar surface. "We will make very basic printing trials in a vacuumenvironment to verify if this is possible," said Enrico Dini, chairman of MonoliteUK Ltd and creator of D-Shape. Dini's D-Shape has created full-size sandstone buildingson Earth by using a 3-D printing process similar to how inkjet printers work.It adds a special inorganic binder to sand so that it can build a structurefrom the bottom up, one layer at a time. The device raises its printer head by just 5 to 10millimeters for each layer, moving from side to side on horizontal beams aswell as up and down on four metal frame columns. 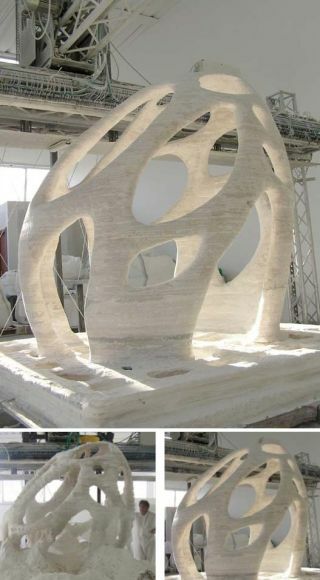 Finished structures end madeout of a marble-like material that's superior to certain types of cement. Thebuildings do not require iron reinforcing. Such a concept might help future lunar colonists live offthe land, as well as provide thick-walled structures that protect against solarstorms or micrometeorites. Space agencies have already begun testing other technologiesmeant to minewater and oxygen from the lunar regolith. NASA scientists have also playedwith possible recipes for a sort of lunarconcrete based on moon dust. But D-Shape offers the added attraction of having asomewhat straightforward building process that does not require huge amounts ofconstruction machinery or many robot laborers. Making the device work in a lunar environment may yetprove tricky. A first challenge involves making D-Shape function within thevacuum environment on a moon that lacks any meaningful atmospheric pressure.But Dini remains self-admittedly optimistic by nature. "I'm not a scientist and I'm not a technician — I'man inventor," Dini told SPACE.com. He spent five years "facingunexpected issues and finding unexpected solutions" when he first designedD-Shape, before heeding the call from ESA. Dini's Monolite has teamed up with an Italian aerospacefirm called Alta, which has a large vacuum chamber in its Pisa facilities. Theyhope to build a small structure perhaps just 3 feet (1 meter) on each sideduring the vacuum trials. Other partners working on the ESA project includeFoster+Partners, a UK architecture firm, and Scuola Superiore Sant?AnnaPerceptual Robotics Laboratory, an Italian lab that specializes in robotics andautomation. A second challenge comes from the cost of running D-Shapetrials by using expensive lunar regolith simulant. Dini has tried developing apossible alternative to NASA's JSC-1 simulant that might work for his research.Structures built from such material will have to undergo resistance testing. Even a functional D-Shape that works with lunar regolithwould still face building limitations based on the amount of binder that arocket could carry to the moon. Yet success would mean transforming lunardust into part of the solution, rather than just a problem for astronautsand robotic explorers. NASA researchers have experimented with a different typeof on-site manufacturing device that could someday createspare parts or new materials for the International Space Station. D-Shape couldalso end up deploying beyond Earth for additional testing, if all goes wellwith the first phase. The most important trialswill be done in outer space," Dini said.